I decided to give the look a go with a blouse from Nataya (via the Wardrobe Shop) and some items in my closet. I was surprised how much I could make an early 20s silhouette with only two pieces actually from the period! The outfit centers around the blouse and its colors. While the blouse is styled in a very modern way on the website, the detailing can actually work quite well for vintage styles. The chainstitch embroidery, sheer fabric, and pintuck details give it an older feel when paired with older garments or silhouettes, so don't be put off by the jeans and camisole styling! I happened to have made this slip recently, and although the length is more fitting of later 1920s hemlines, it's the only 20s slip I've got at the moment. I don't mind it though, as the satin texture and lighter color matches the embroidery on the Nataya blouse and lets the details show up more. 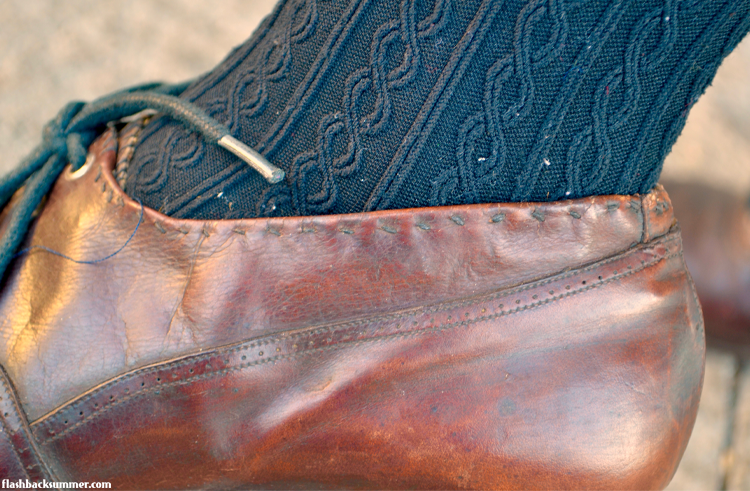 I paired it with a black belt to match some silhouettes I saw in a 1921 magazine, but it also looked good without it. 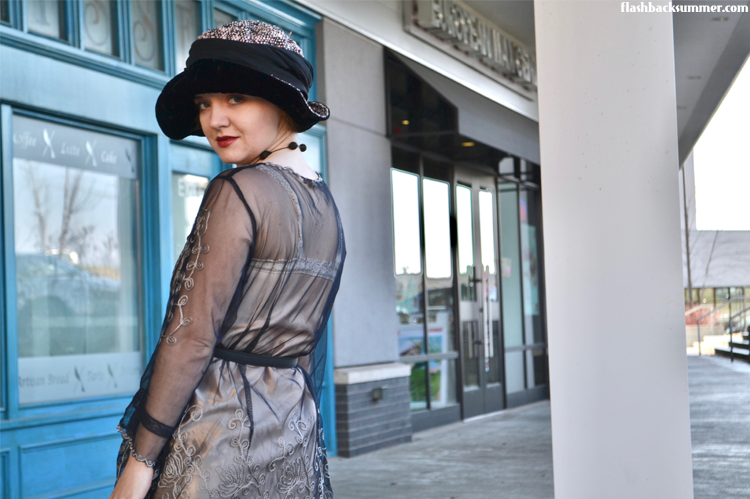 While on an initial glance some of the items in the Wardrobe Shop may appear a bit costume-y, there are several pieces that are great for 1910s-1930s outfits. The blouse I got, for example, is great for when I want a vintage vibe but a hardier piece of clothing I'm not afraid of ruining. The one I'm wearing is a size small (the smallest available), but as you can see it is much longer on me than the website model. Of course, I'm only 5' tall, so that's pretty common. The width of the shoulders is a bit wide for my narrow frame, but I'm just going to put a tiny pleat in the back and all will be well. If you have a more average shoulder width, it would fit you just fine! I was also quite happy with how my hat turned out! This hat and opera coat shown here are actually 1950s couture kindly given to me by some friends living in Paris. It belonged to one of their family members, and they were nice enough to gift it to me. 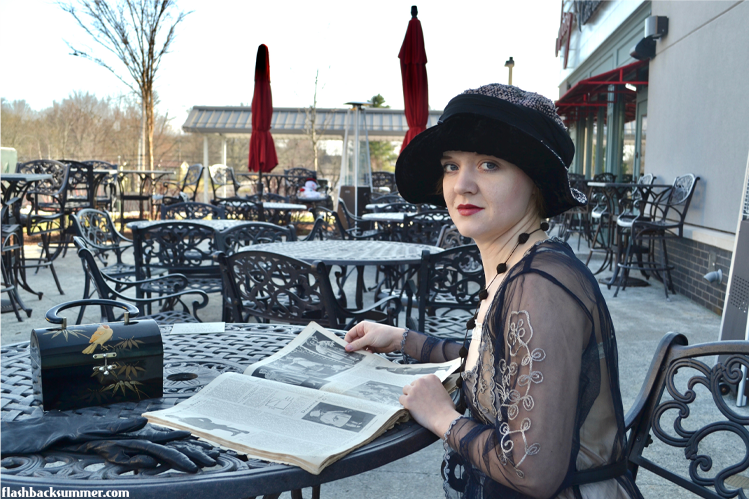 The hat is a bucket hat shape, and I pinned up the front and back to resemble the hat shown in a 1921 magazine. I also took a sheer black scarf and wrapped it around the crown to add a bit more volume. I think it looks pretty 20s for a 50s hat! While the purse is also probably a 1950s or 60s pieces, the shoes are one of the actual vintage pieces, and they have a pretty cool secret! They're actually 1910s boots that have been cut down; how cool is that?! And I know this for sure because I bought them with the cut off pieces included, and there are tiny little hand stitches around the edges and tongues of each shoe. Make do and mend finery, right here! The necklace is a random bit I found with some antique trims. It's a hand-crocheted piece, and I absolutely love it. A long, black necklace is pretty much a 1920s accessory staple! So what do you think? 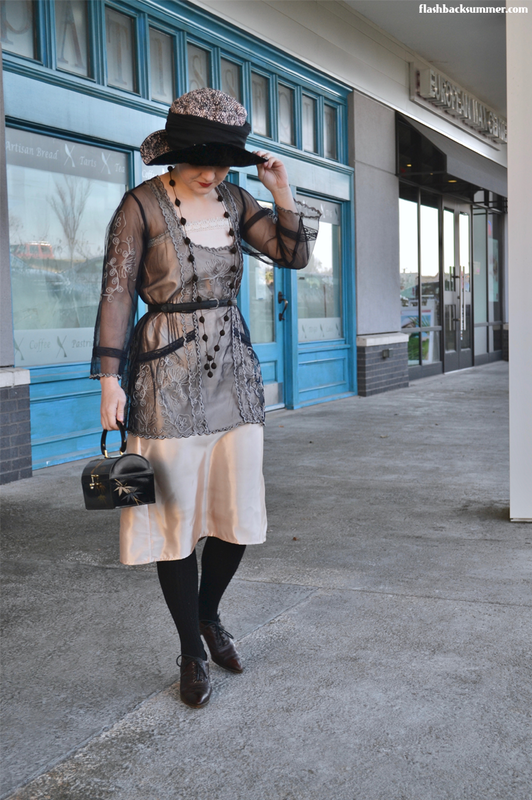 Even though only a couple pieces are actually from the early 1920s, do you think this ensemble works? Have you ever looked into the transitional early 1920s silhouettes and styles? What do you think of them? This blouse was provided c/o the Wardrobe Shop, but all opinions are honest and my own. For more information on my review standards, check out my policy page. This is absolutely gorgeous! 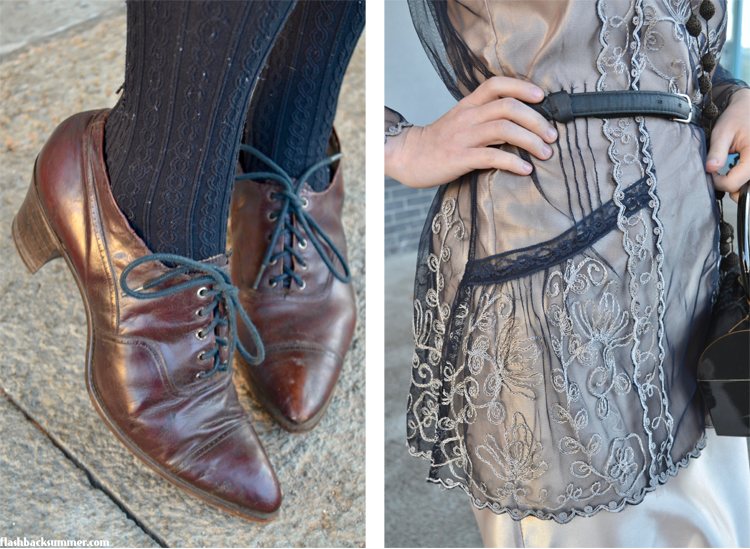 I had a brief love affair with the late 1910s and early 1920s last year, and while I still love the fashions, I concluded that they weren't really great for everyday wear for me (four small children, etc). They are very comfortable, however, and I really enjoyed making what I did. Ooo, yes, small children require hardy clothing, haha! Thank you Juliana! This has such an authentic air, it's a very good job! The blouse is stunning, and you really did work wonders on the hat. Very inspiring, I'll have to see what my own wardrobe holds and try to create something similar! Fabulous look, I love it! It works so well Emileigh! When I started to look at the pictures, I quickly checked ahead to see if you had gotten your hands on an actual early 20s hat! It is amazing what you can do with some folds and tucks and pins, especially with brims, and you've done a great job. With the hat and the whole outfit. I love it. That's such a compliment from a hat-maker like you! Thank you! Stunning outfit! What a great job you did staying true to the period, and yet it totally works. Well done!! This totally works! I really adore this outfit. And what a fun story behind your shoes! I loved that. What a neat find those shoes are, too- I've never heard of boots being cut down into shoes. That's so cool!